Manchester United face their toughest test of the season so far on Saturday 10th September, as they prepare to lock horns with Manchester City. The game will mark the first Manchester derby between José Mourinho and Pep Guardiola, a rivalry that stems from Spain’s top flight and is guaranteed to produce sparks. There are a few players missing from United’s line-up due to injury, and City’s main man Sergio Aguero will also miss the game due to suspension over a violent conduct charge. Luke Shaw is a doubt for the game as he was withdrawn from England’s squad for their 1-0 win over Slovakia, and Mkhitaryan will definitely be out due to an injury he picked up in Armenia’s 3-0 loss to Czech Republic. Both clubs have started the Premier League campaign with a 100% win record, and even this early in the season, three points and bragging rights are seen as an absolute necessity for each side. 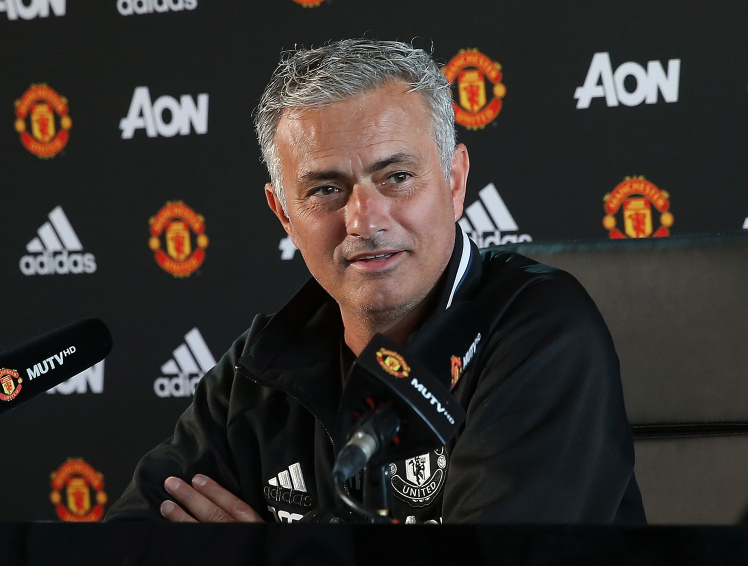 Mourinho has opted for the 4-2-3-1 formation so far this season, giving reason to not expect any different in such a big game. David De Gea in goal is more or less a certainty these days, and the back four of Shaw, Blind, Bailly and Valencia has looked sturdy so far, and should remain the same. Shaw is a doubt for the game after he was withdrawn from England’s squad last week, but it was only seen as a precautionary measure and he should be fit. Marouane Fellaini was also a doubt for the game due to a back injury, but the club have confirmed that the Belgian midfielder has been given the all clear and is fit to play on Saturday. He will play alongside Pogba, a midfield partnership which Mourinho has favoured so far this season. 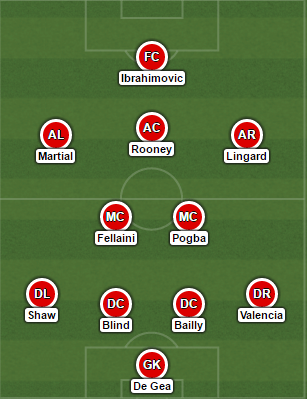 The three players that I believe will start in front of the midfield pivot are Martial (left), Rooney (centre) and Lingard (right). Lingard could get the nod to start on the right due to Mkhitaryan’s injury, and Rooney and Martial are certain to start in Mourinho’s eleven. Up front is none other than Zlatan Ibrahimovic, who has made a strong start to life in the Premier League, scoring three goals in his first three league games.